Mrs. Deloris Ann Aubert, age 71 of Elkton, passed away 2:00 PM Sunday, March 24, 2019 at her residence of natural causes. 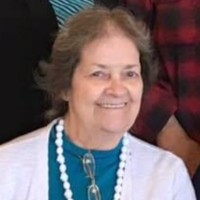 Services for Mrs. Aubert will be 12 Noon Wednesday, March 27, 2019 at Evening Light Tabernacle Church in Elkton with Rev. Thomas Byler officiating. Burial will follow in the Church Cemetery. Visitation will be from 5:00 PM to 8:00 PM Tuesday at the church and from 10:00 AM until time for the service on Wednesday. Latham Funeral Home is in charge of the arrangements. Mrs. Aubert was born July 7, 1947 in Chicago, IL. She had been employed by Cracker Barrel Restaurant in Clarksville, TN and Flynn Enterprises in Hopkinsville. She was a faithful member of the Evening Light Tabernacle in Elkton. She was preceded in death by her parents, Ray Hodge and Clara Burnaine Hodge, her brother, Eddie Hodge and her twin sister, Doris Hodge Dyce. She is survived by her husband of 28 years, Alvin Aubert of Elkton; her daughters, Tammy Pickard and her husband, Kevin of West Lake, Louisiana and Gina Bell of Clarksville, TN; her sisters, Margaret Janice Dyce of Clarksville, TN and Donna Ray Bishop of Clifty; three grandchildren, Kayla Ann Cortez and her husband Alvaro, Shelby Ann Lauren Pickard and Dalton Bell; two great grandchildren, Alexander Cortez and Abigail Grace Neviles.